OpinionEQ Decision Dashboard Providing online access to the OpinionEQ SMI Decision Platform, the Dashboard allows users to create studies based on multiple combinations of brands, products, content sites and features. These studies can then be run in real time and the results can be analyzed through a wide range of highly customizable reports. The Dashboard also provides addtional data and reporting features, such as top idenitifed products and feature, word frequencies, and direct access to the data used to complete the study, with drill-down all the way to the source page of the content. 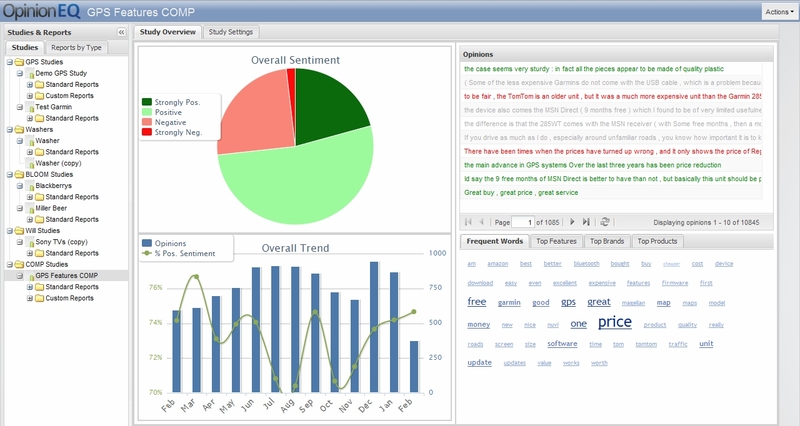 Custom Reporting and Analysis OpinionEQ also provides more conventional sentiment analysis surveys and studies, where customers can request a detailed analysis of large amounts of Social Media Content to be delivered in document form. OpinionEQ provides the highest quality of professional services for customizing the SMI Decision Platform to the needs and technology of your organization. Whether it be integrating analysis tools into your existing applications or delivering a special analysis or report concerning your organization's Competitive Intelligence needs, we stand ready to deliver services to enhance your ability to deliver quality to your customers. FIFA World Cup provides stream of sentiments for real-time analysis.